Lugarde Moscow Log Cabins: The Lugarde Moscow Log cabin is a simple but very attractive garden building and is presented as standard with a single door and one casement window (opening outwards) the Moscow log cabin has 44mm wall logs. The Lugarde Moscow has a built in canopy measuring 300 x 450cm and solid walls to the side and back of the canopy with railings on the front, the canopy posts are 12cm x 12cm. This Lugarde Moscow Log Cabin offers a 250 x 300 room which can be used in many ways and a large canopy area ideal for dining outside or just a relaxing area to sit in. 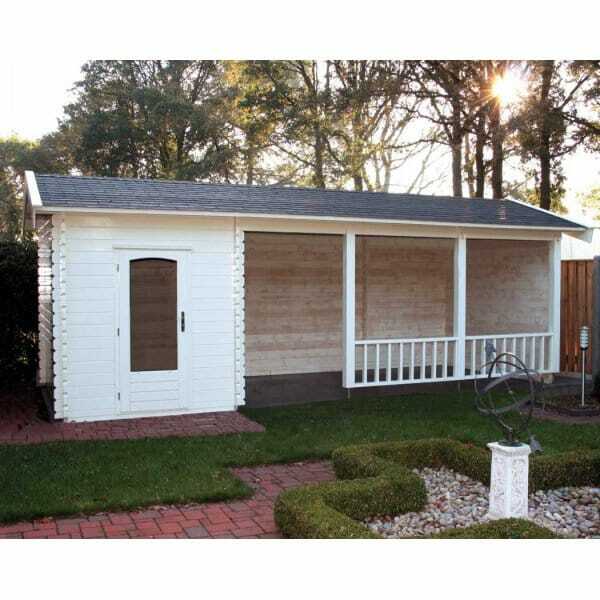 The Lugarde Moscow Log cabin is available from Simply Log Cabins.